Most of the activities that you do in your home depend on the use of power whether you want to cook some food or watch TV, you need electricity. But what if there’s a power outage? In this case, a portable generator can help you sustain your way of life until the mains power is restored. This type of device can also help you enjoy recreational activities like camping even more and give you power to use your tools when you run projects anywhere in the house. 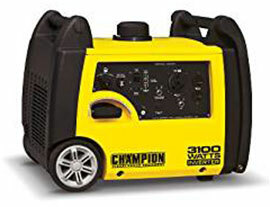 The next logical question is how to pinpoint the best portable generators out of the many available in the market. There are various factors which you need to consider before you go shopping. Your power requirements come first. Then you need to decide on the level of portability which you require and on how pure you want the delivered power to be. In general, there are two main categories which you should be aware of when searching for the best portable power generators. The traditional generators are fairly large devices set in a metal frame which wheels are added to. The inverter generators are much more compact and deliver energy which has low total harmonic distortion and is therefore safe for powering devices with microprocessors. Use this guide to help you choose the best portable generator for you. When the power goes out, you can just power the appliances in your home with the generator and turn the lights on, keep groceries refrigerated, cook food and turn on an electric heater or a fan. To ensure that you will get a sufficiently powerful unit for your needs, you have to calculate how much power in terms of running watts the appliances and advises, which you need to use in emergencies, will require. Remember that you will need three times the running watts for starting the appliances and devices. You should also pay close attention to the running time, the fuel tank capacity and features which contribute to convenience, smooth performance and portability. Take a closer look at some of the best generators for home use. 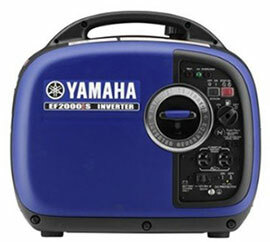 With Yamaha EF2000iSv2, you will get 1600 watts of power and 2000 watts of surge power to use in case of a blackout. You can use it to get light in your home and run a few appliances. This generator uses an inverter system with pulse width modulation control to enable you to power even sensitive items like computers, tablets and smartphones. The generator weighs 45 pounds and takes 2.2 cubic feet of space – It’s very light and compact so carrying it around is easy. 4-stroke OHV engine – Designed to offer more reliable performance and to have better cooling and durability. Clean power production – Thanks to the inverter technology, the voltage stability is excellent. Smart throttle – This feature helps to regulate the engine’s work based on the load and as a result you get higher fuel economy and quieter operation. Quiet muffler – Thanks to it, the portable generator produces 51.5 dBA at 1/4 load. Continuous operation of 10.5 hours at 1/4 load – This is pretty good for a small generator like Yamaha EF2000iSv2. No fuel pump for connecting an auxiliary tank system. 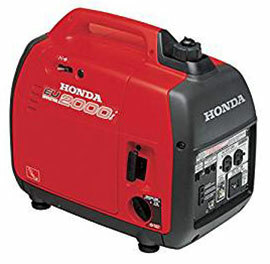 As a product of a leading brand in the market for inverter generators, Honda EU2000I has a lot to offer. It produces 1600 wats of running power and 2000 watts of surge power. The inverter technology enables you to power any kind of gadget with a microprocessor so it’s easy to keep up with the news and get some entertainment during a power outage. The inverter generator weighs just 46 pounds. Honda GX100 engine – You can expect powerful and dependable performance from it. Recoil start – You need to pull the cord to start the engine. Run time of 8.1 hours at 1/4 load – This is quite good given the size of Honda EU2000I. Low oil alert – With this feature, the generator stops working automatically when the oil becomes dangerously low to protect the motor. Circuit protection for minimizing the risk of accidents – This is standard feature which you can expect to find in all of the best portable generators. When it comes to evaluating the best portable generators, the reputation of the manufacturer is always important. 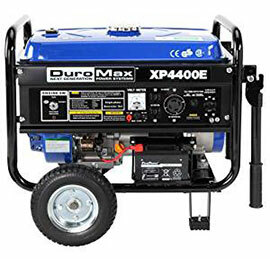 DuroMax XP4400E has that on its side plus 3500 wats of continuous running power and 4400 watts of surge power. Air-cooled 4-cycle OHV engine making 7 horsepower – You can expect superb and very powerful performance for a long time to come. Electric start in addition to the recoil one – Get the engine running with a push of a button. DuroMax RV switch – With it, you can choose to operate the generator at both 120 and 240 volts at the same time. Wheel kit – The two wheels come with all-terrain tires which are designed not to go flat. If you want to have most of the appliances in your home running in the event of a blackout, consider Westinghouse WH7500E, which produces 7500 watts of continuous power and 9000 watts of surge power. It’s great to be able to enjoy the air conditioning when the temperature outside is simply unbearable and to be able not only to cook food, but to make coffee and prepare toasts for the whole family at the same time. 420cc Westinghouse 4-stroke OHV engine with an iron sleeve which is made to last – Expect completely dependable performance. Electric start – Just push the button and forget about the hassle. There is also a coil start for backup. Plug-and-Play set – It includes a battery charger for the electric start, oil and an oil funnel for turning the engine on right away and a tool kit. 4 120-volt power outlets and 1 twist lock outlet – You can easily power several appliances directly. 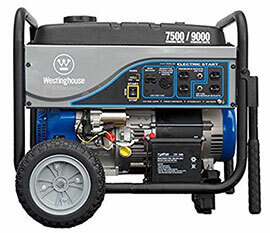 Westinghouse WH7500E is compatible with the Westinghouse manual transfer switch for connecting the generator to the power grid of the house – The switch is not included in the package. The great outdoors give you an amazing opportunity to relax and have fun, but this doesn’t mean that you should deprive yourself of modern conveniences. With Yamaha EF2000iSv2 and Honda EU2000i, you can have the best of both worlds. Both inverter power generators produce 1600 watts of running power. More importantly, thanks to the inverter technology, the total harmonic distortion is extremely low, meaning you can power even devices like laptops, tablets, smartphones, MP3 players and the like. Of course, you can also power appliances like cook tops, coffee makers and other modern-day items which will make the experience truly unforgettable. The two best portable generators in the inverter category are extremely lightweight and compact and come with an ergonomic handle. You can fit your generator in the car’s trunk without hassle and carry it with ease when you have to walk from the car to the tent or when you are mounting the boat. The quiet operation is another huge advantage of Yamaha EF2000iSv2and Honda EU2000i. You can take a comfortable nap and even a good night’s sleep while the generator is working just a short distance away from you. These inverter generators and Yamaha EF2000iSv2, in particular, boast with great run time for their size. You don’t have to worry about refueling way too often. You don’t have to be a rocket scientist to work with either one of these portable generators. They don’t require special setup and are pretty easy to operate. Just add oil and fuel following the instructions, connect the item or items which you want to power and you are good to go. You can forget about the technical matters and enjoy your favorite activity, be it camping, boating, tailgating or hunting. Maintenance is also a breeze and the best part is that you can expect your new inverter generator, be it Yamaha EF2000iSv2or Honda EU2000i, to work reliably for a long time to come. If you enjoy RV adventures, you should definitely consider taking advantage of Yamaha EF2000iSv2or Honda EU2000i. Both of these models from reputable brands can work in pairs to deliver double the amount of running power (3200 watts) and surge power (4000 watts). Just pair two units of your generator model and you’re good to go. You can easily power the AC, appliances and electronic devices which you need to run in your RV and enjoy benefits like smooth and quiet operation and long runtime. Preparing breakfast and watching TV or playing video games in the evening has never been more convenient. It’s easy to use two inverter generators, either Yamaha EF2000iSv2 or Honda EU2000i, simultaneously. You just need a twin cable to connect them. While it is not a standard accessory included in the package, it is easy to obtain. Fitting the two generators in your RV for transportation shouldn’t be a challenge at all, given the small amount of space which they take. As long as you’ve got fuel and oil with you, you’re good to go. Just set up the units outside your RV, plug the cable in and let them do their work. Both models have great runtimes for their size. You can just look briefly at the main features and capabilities of Champion 75531i to see why it is the winner in the best value for money category. This inverter generator can power both appliances and sensitive electronic equipment without any risk. It produces 2800 watts of running power and 3100 watts of surge power and this makes it more powerful compared to the traditional inverter models. Another thing which makes it stand out is that it’s RV ready so you can start using it straight away when you go on a trip. Recoil start – You need to pull the handle to get the engine running. Producing power with THD (total harmonic distortion) lower than 3% – When you have THD lower than 6%, the power is clean and therefore the generator is suitable for powering electronics. Economy Mode – This one of the best portable generators uses special technology to regulate the work of the engine based on the amount of power required, helping you save on fuel and enjoy smooth engine performance for longer. Noise production of 58 dB from a distance of 23 feet – The model scores well in this category. 120V 30A RV outlet, two 120V 20A outlets and 12V DC outlet, which comes with battery changing cables – Thanks to the highly diverse outlets, you can use Champion 75531i both for emergency backup power and for recreation. Quick touch panel – All controls are set together for your convenience. 8 hours of runtime at 1/4 load – This is quite good. Low oil shut-off feature – The engine stops working automatically when the amount of oil reaches the critical minimum. Foldaway handle and wheel kit – You don’t have to carry the Champion 75531i portable generator, but roll it to save effort and time. The best portable generators are dependable and durable and provide sufficient power for you to enjoy all the benefits of modern life coming from lighting, appliances and electronic devices. They have multiple uses and this is something extremely important to keep in mind. The best portable emergency generators are used for utility power backup and can prove to be invaluable, especially during longer blackouts associated with natural disasters. With such a unit, especially if it has a large capacity, you can have the lights and all of your main appliances working. This will make cooking, washing and maintaining optimal indoor temperature easy and convenient. The smaller and lighter inverter models are the best portable generators for all kinds of recreational activities. With the typical inverter generator being the size of a small suitcase, you can easily fit it in your car trunk along with your gear and personal belongings. It will help you feel like home without any effort on your part. You can expect an inverter generator to perform smoothly and safely at all times. Whether you prefer to sleep in a tent or to explore the outdoors in your RV, such a unit could really prove to be invaluable, especially given that you can use it for a long time to come.